A Few Ways Answer "What Is Your Greatest Weakness?" 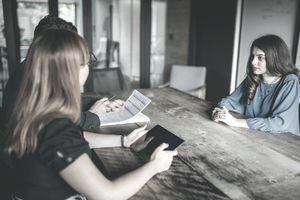 One approach to answering this question is to analyze the key skills and strengths required for the position you are interviewing for, and then come up with an honest shortcoming that is not essential for success in that job. For example, if you are applying for a nursing job, you might share that you are not particularly adept at conducting group presentations. In this case, it would be critical to underscore your strength in one-on-one communication with patients, while providing an example of your difficulty with presentations to large groups. Another option is to discuss skills that you have improved upon during your previous job, or that you are actively working on improving. This shows the interviewer that you’re committed to self-improvement. Begin your answer by talking about where you started, discussing the steps you took to improve, then highlight the outcome. For example, you might say, “One skill set I improved in the past was my salesmanship skills. As a product manager who works with internal teams and does not interface with clients or sales prospects, I don’t do much, if any, ‘selling’ in my role. However, since I do communicate quite frequently with the sales team, I felt it might benefit me to have a greater understanding of their strategies and tactics.” I took a sales skills course online and it not only improved how I work with sales teams. If you use this strategy, be sure not to mention anything that you improved upon that would be critical to the job for which you are interviewing, as you don't want your qualifications for the job to be questioned. Another option is to turn a negative into a positive. For example, a sense of urgency to complete projects can be turned into a positive; e.g., you are a candidate who will make sure a project is done on time. Or, perhaps you find yourself with an attention to detail that leads you to triple-check every item on a spreadsheet and proofread every email you sent twice. Regardless of what you say, it is critical to indicate that you are aware and mindful of this trait, and capable of preventing it from interfering with your productivity. For instance, building on the example above, you might say, “I have a very strong attention to detail. Sometimes, this attention to detail can turn into perfectionist tendencies. In the past, I found this leading me to triple-check every item on a spreadsheet, or closely proofreading emails to ensure I’ve communicated what I’m trying to get across in a clear, concise way, or fiddling with the layout of a presentation to ensure that it is perfect. Keep in mind that how you answer job interview questions about weaknesses matters just as much as what you say. It’s important to note that the term "weakness" isn't used in the sample answers — you always want to focus on the positive when interviewing. You can use these samples as inspiration for your own response. Note that it’s important that your answer be authentic, and tailored to your own circumstances. Of all the questions that you are likely to be asked in an interview, this is not one where you want to risk coming across as disingenuous. If you’re coming up blank, reviewing examples of weaknesses may help get your wheels turning. Keep in mind that an interviewer may ask a variation of this question, such as “What part of the job will be most challenging for you?” Be sure to familiarize yourself with these variations. In addition, a question about your greatest weakness is often paired with an equally (if not more) important question about your greatest strength.